After a pretty long gap InvestorZclub has come out with an investment idea. The reason for the gap has been continuous fall in risky assets and uncertainties in global markets in past 6 months. But sentiments are now much better and barring Greece, global economy is in a relatively better shape. It appears that even if markets falls it will not be very deep. Hence companies in promising sector, sound management and reasonable valuations can be bought at every dip. One such company that fits all the above three criteria of InvestorZclub is Adani Ports and SEZ. Investors with a three-year perspective can consider exposure to company's stock which is currently ruling at a price of Rs.150 as on 17th Feb 2012. The company has taken advantage of the perennial capacity constraint in major ports to quickly build a premium clientele for itself. As a result, its volumes expanded a robust 27 per cent compounded annually in the last three years ending FY-11 as against a mere 3 per cent expansion managed by major ports. The company's diversified cargo profile, more third-party clients when compared with players such as Essar Ports and a good proportion of take-or-pay contracts with customers, make it a superior play among the three listed ports. At 19 times its expected per share earnings for FY-13, the stock is at a discount to other port plays. Commissioning of Hazira and Marmugao ports will also add significantly to the top-line in FY 13-14. The best part of being a shareholder of this company is that ports business has very high entry barriers and takes humongous amount of time and money to setup. As a result the stock will always enjoy a premium valuation like Apollo hospitals. Coal can be expected to remain Adani Ports' key volume driver. Much as the Government has assured domestic coal supply to power projects, there still remains a huge deficit that can only be met by importing coal. Diverse clients such as Maruti, IOC and HPCL also offer assured revenue streams. Adani Ports has also done reasonably well in leasing its SEZ land to companies such as Thermax, Mitsubishi and Bharat Forge besides the oil marketing companies. This said, the stock of Adani Ports saw a sharp fall after its highly leveraged (Rs 8,600 crore) acquisition of the Australian port Abbott Point ballooned debt at its subsidiary. However, the point to note here is that Abbott Point's capacity at 50 million tonnes is only little less than Adani Ports' volume. 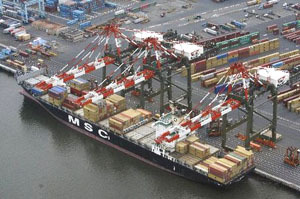 The port has assured take-or-pay contracts with nine clients, including BHP Billiton, Rio Tinto and Mitsui. Its operating cash flows are expected to service the debt comfortably. A rough estimate suggests that interest cover of the consolidated entity will be 3-4 times. That means, Adani Ports' debt servicing, despite high leverage, will be comfortable. Two, the bridge loans taken at 3 per cent are now being refinanced with debt (two-thirds in Australian dollars with rest in US dollars) that is expected to have interest rate of little over 6 per cent. Currency risk is mostly mitigated by using the Australian dollar to borrow and service debt. The consolidated numbers are not yet available now. On a standalone basis, Adani Ports saw a 44 per cent growth in sales to Rs 1749 crore for the nine months ending December 2011 over a year ago. Net profits expanded 29 per cent to Rs 838 crore. Considering all the above factors, one can start accumulating the stock on every fall. 52 week high low for the stock is 170 / 111. At the current market price of Rs.150 it commands a market value of Rs. 30,000 crores.